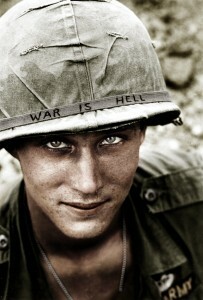 Horst Faas was an infamous war photographer that shot extensively through the Vietnam War theater. 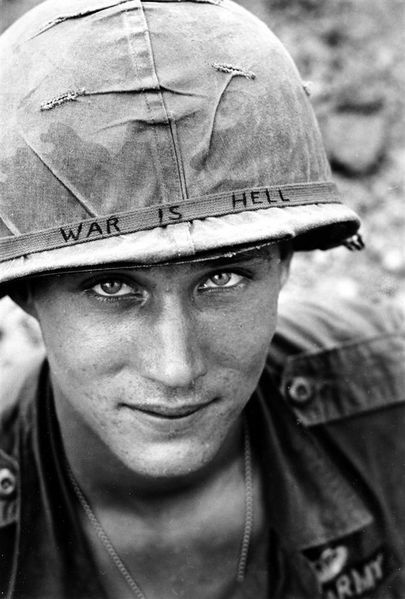 With another author he published a book on his and other photojournalist’s time in South East Asia titled, Requiem: By the Photographers Who Died in Vietnam and Indochina He captured the War Is Hell image while touring South Vietnam in 1965. The picture was always left uncaptioned and the face unidentified until it was revealed that the man was Larry Wayne Chaffin. the unidentified Army solider picture was shot June 18, 1965, and the soldier was with the 173rd Airborne Brigade Battalion on defense duty at Phouc Vinh airstrip in South Vietnam. All match up with Chaffin’s war record and where he was deployed. According to the 173rd’s records on June 18, 1965 the units were sent to the town of Dong Xoai north of War Zone “D” after reports of Viet Cong activity. There was no contact and so they returned to the their base but that the deployment was successful as the Americans were able to deploy a battalion task force within hours. Like a lot of Vietnam Vets he had trouble adjusting to life back home and died at the age of 39 from complications that arose from diabetes. The family is convinced that the diabetes was a result of his exposure to the infamous Agent Orange, a defoliant agent used in Vietnam and linked to multiple health issues. He died December 3, 1985, and is buried at Jefferson Barracks National Cemetery in St. Louis. Fass was born in Germany and started his photography career at 21. During the Vietnam War he was a photo-editor as well as photojournalist. 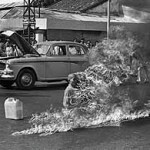 He was instrumental at getting two of the most famous Vietnam War pictures published the Vietnam Execution and the shot of naked Vietnamese girl running down the road. 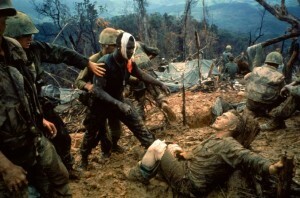 He 1967 an injury after he was hit by a RPG almost ended his life and left him with serious injuries to his legs. 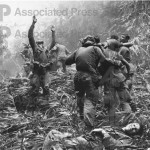 As chief photographer for the Associated Press (AP) in Saigon he won the 1965 Pulitzer Prize and then in 1972 Faas won a second Pulitzer Prize for his pictures of torture and executions in Bangladesh. He was based in South Vietnam until 1974, in 1976 he moved to London and worked at the AP office until 2004. 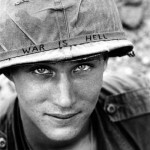 In addition to Requiem: By the Photographers Who Died in Vietnam and Indochina he also co-wrote, Lost Over Laos: A True Story Of Tragedy, Mystery, And Friendship He died Thursday May 10, 2012, he was 79..